Fast facts: Who are the Rohingyas? The Rohingya are an ethnic group from Myanmar, majority of them Muslim. They have been denied citizenship in Myanmar since 1982 and fleeing escalating violence perpetrated by the army. Since August 2017, 707,000 new Rohingya refugees have come to Bangladesh. Bangladesh has hosted Rohingya refugees for three decades, there are a total 918,936 Rohingya refugees in Cox’s Bazar (as of 21 June, 2018). Among them, 52 per cent are women and girls and 16 per cent are single mothers. As of June 2018, the UN Women Multi-Purpose Women’s Centre in Bhalukhali camp has served 9,922 women and teenage girls and 946 children. Bangladesh has been hosting Rohingya refugees from Myanmar for nearly three decades. The recent influx of Rohingya refugees fleeing escalating violence in Rakhine State since August 2017 has more than doubled the total refugee population in Bangladesh. There are nearly 1 million Rohingya refugees in Cox’s Bazar now, and the majority of them are women and girls. The Rohingya, an ethnic group from Myanmar, are now at the centre of one of the fastest-growing refugee crises in the world. The camps are overcrowded, needs are immediate and enormous, and resources are stretched. UN Women is on the ground, addressing the needs of women and girl refugees arriving in Bangladesh. We’ve provided dignity kits, safe spaces and skills training, while engaging in high-level advocacy to promote women’s leadership in peacebuilding, disaster mitigation and resilience. On World Humanitarian Day, find out more about the Rohingya crisis. 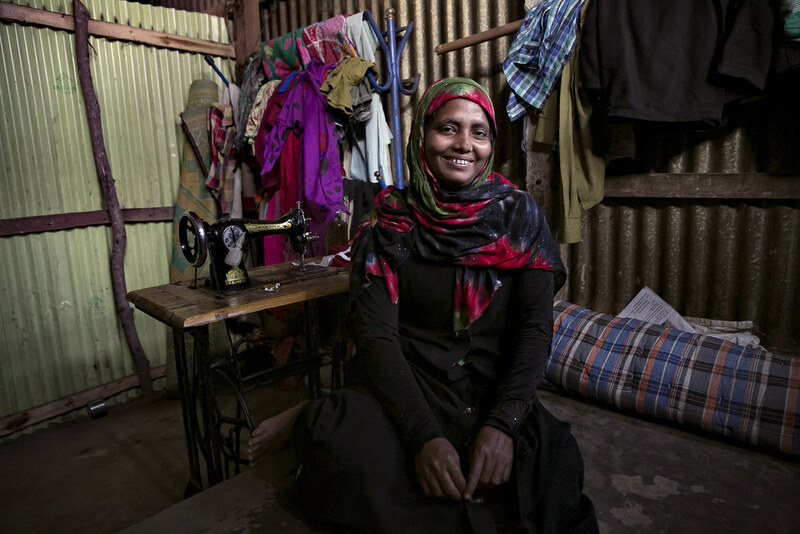 In January 2018, UN Women set up the first Multi-Purpose Women’s Centre (MPWC) in the Balukhali refugee camp in Cox’s Bazar, in partnership with Action Aid and with support from the UN Women National Committee of Australia. Another women’s centre is under construction in Ukhiya. The Centres are one-stop information hubs for women to access life-saving information and participate in awareness sessions on health, nutrition, prevention of gender-based violence, and other issues. They also offer referrals to services, psycho-social support, skills training and peer mentoring with Rohingya women who arrived in Bangladesh before the crisis of August 2017. The Centres are safe spaces for Rohingya women and adolescent girls, with child care and private rooms where they can breastfeed. They also offer secure bathing spaces and women-only toilets. Due to security and privacy concerns, women and girls often avoid using the common toilets and bathing spaces in the camp. Marie Sophie Pettersson, a Humanitarian Action and Resilience-Building Programme Specialist with UN Women, visited the camps in Cox’s Bazar in 2017 to observe the gender dynamics and gather women’s needs and opinions. “My job was to talk to Rohingya women in the refugee camps, and make sure that the humanitarian action in Cox’s Bazar was shaped by their voices, protected their rights and met their unique needs,” she says. Her work led to concrete measures to improve services for women, such as extended hours for health worker visits at the camps, and fed into the drafting of the Gender Profile brief, which shaped the measures in the overall crisis response. After they arrive to relative safety in Bangladesh, Rohingya women need practical products and services to meet health needs, as well as means to tackle escalating climate disasters. Cox’s Bazar, where the refugee camps are located, gets some of the highest rainfalls in Bangladesh and the make-shift shelters at the camps can barely withstand flooding of the magnitude that Bangladesh suffers. Mahmuda Begum, 23, lives in a flimsy shelter at Moynerghona, Balukhali camp, in Cox’s Bazar. She was 8 months pregnant when she fled Myanmar and in September 2017, gave birth to a baby boy. She urgently needed clothes, medicines and hygiene products for herself and the newborn child—items that are not typically found in relief kits. As part of its first response in late 2017, UN Women, together with Action Aid and the Bangladesh Ministry of Women’s Affairs, distributed what is popularly known as “dignity kits” to more than 8,000 Rohingya women refugees. The kits had soap, clothing, scarves, menstrual hygiene products and products for new mothers, as well as solar lamps, blankets and alternative cooking fuel—compressed rice husk briquettes—to reduce women’s exposure to smoke. “Most of all, I am worried about the monsoon season. We are in a low-lying area… will our small shelter keep standing?” asks 22-year old Minara Begum. She walked for five days without any food and gave her gold nose pin to a boatman to cross the river into Bangladesh. Since the monsoon arrived in May, many shelters and latrines have been damaged or destroyed by landslides and flooding. The UN system galvanized and trained community volunteers and radio listening groups in the camps so that the Rohingya and their host community members could better prepare for the monsoon. Sara Khatun, aged 45, has become a member of an emergency response team in Balukhali camp. “Through the disaster preparedness sessions, I learned how to get timely updates on cyclones through radio and announcements at the mosque,” she said. Others have learned to preserve dry food and how to seek support to buffer their shelters. Building resilience also means empowering Rohingya women refugees to have a voice in the day-to-day decisions that impact their lives in the camp. To commemorate World Refugee Day, an interactive art session was hosted by UN Women “Awareness through Art” Balukhali for women and girl refugees to enjoy their right to a life of dignity. The art session aimed to give Rohingya women and girls the rare opportunity to express their feelings and aspiration in visual form for the world to see! For most participants, holding a brush was a firsthand transformative journey which not only allowed them self-expression but also provided a safe platform to voice out the myriad of challenges they face daily for existing as a vulnerable woman in a foreign land. Celebrating the International Women’s Day, on 8 March 2018 the Rohingya women refugees at UN Women’s Multi-Purpose Women’s Centres made kites and wrote their demands and wishes on them and had adolescent girls and children flying them. Later on, the women had a meeting with the Camp in Charge raising their issues, concerns and needs by presenting him with a charter of Demand. UN Women Executive Director, Phumzile Mlambo-Ngcuka, undertook her first official visit to Bangladesh, from 30 January to 3 February 2018, meeting with key government and civil society partners as well as international development actors both in Dhaka, and in Cox’s Bazar, where the Rohingya refugee response is taking place. “For Bangladesh’s NAP [National Action Plan] to be effective, civil society actors must continue to play an integral role going forward, sharing their invaluable expertise and vision for a more peaceful and equal society,” she said during a Symposium on the Development of a National Action Plan (NAP) on Women, Peace and Security for Bangladesh in Dhaka. During her trip, the Executive Director also engaged in a dialogue focused on strengthening government accountability for implementing the laws and policies adopted to promote gender equality in Bangladesh. A Memorandum of Understanding was signed between UN Women and the National Human Rights Commission of Bangladesh, accentuating the “aligned mutual interest” of both parties to end impunity for conflict-related sexual violence, through their work on peace, security and humanitarian action. UN Women continues to seek partnerships for change and donations to support its work with Rohingya refugees in Bangladesh. Strategic Executive Group (February 2018). Joint Response Plan for Rohingya Humanitarian Crisis March-December 2018. p. 7.